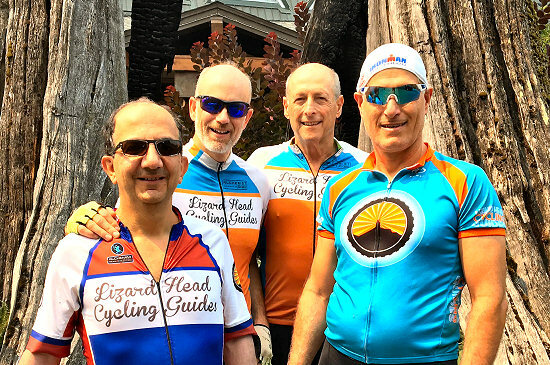 Our guests love to ride with Lizard Head Cycling Guides! We’ll take you where you can’t go alone. Lizard Head Cycling Tours specializes in offering exclusive, custom, road cycling and mountain biking experiences. Company founder & owner, John Humphries, works to handcraft each tour to best explore select regions on lightly traveled roads. The lodges, Inns and resorts are chosen for location and the spirit that they exude. Humphries is to cycling tours as a brew master is to handcrafted micro-beers, winemakers to a signature Pinot Noir and writers to the details of a novel. Designing and leading cycling trips and mountain bike tours is his art. Lizard Head Cycling Guides offers its clients opportunities to pedal over lush, mountain passes in the shadow of snow-capped, mountain ranges or along winding rivers, in the shadow of red-rock, desert walls. The goal is to inspire cyclists on off-the-beaten-path places. Clients need not worry about traffic; there is very little where we’re going. Instead, you can focus on pedaling and the surrounding scenery. Get out of your normal realm and do what you never thought possible. By taking you to the most remote places in the southwest, Lizard Head Cycling literally removes you from your daily life, puts you on a bike and lets you become a kid again. Just like at kindergarten recess, there are no distractions, just opportunities to play. Your computers, cell phones, to do lists, and office woes become a thing of the past. Additionally, the tours provide epic challenges and the support to overcome them. Each morning begins with a goal, and each day ends by accomplishing it. During the miles in between, your personal journey unfolds. Humphries has been leading trips for over a decade and aside for his love of cycling and the outdoors, it’s the inspiring client feedback from each trip that keeps him at it year after year. Yes, you are fit enough… but here are some training tips. Most people don’t feel like they are fit enough when the tour begins, and that’s okay. The tours are designed so that participants gain strength each day, and “layover” days, full-day breaks, are built in. On these days clients enjoy exploring small towns, massages, coffee shops, hikes and even river rafting. Humphries says. “You will be ready for the tour when you’ve completed it,” he jokes. But, that’s not to say you shouldn’t train. According to Humphries if you can get in 100 miles a week, that’s really good. But most people get in a few short rides, or spin classes, during the week, then complete a longer ride, 50 miles or so, on the weekends. “Only about 50% of our clients ride every mile of every tour. The goal is ride into a new landscape and relaxation is key,” he says. Ride in a group and meet new friends. There is no single demographic that makes up Lizard Head clients. We have mother/son, father/son clients, as well as friends and couples who sign up together. We also have a lot of clients who come by themselves. There are no age limits and many of our toughest clients have been folks in their 60s and older. You don’t have to go fast to complete our tours; you just have to keep moving. When you want to stop, you take a bump in the van. There is a fantastic, accidental social element of Lizard Head Cycling tours. Because we choose remote areas, we can ride a few abreast enabling clients to experience a “peloton-like” energy savings from riding together. Cycling can be a lot of suffering, by itself on the road, but when you have a critical mass of riders, it is social and fun. Inevitably, each group gels and people walk away from their trips with new friends. Each day brings an opportunity to overcome small and large challenges and the energy from the physical exertion is contagious. Throughout the trip, the group bonds over its shared accomplishments. Lizard Head provides the support and equipment to achieve your cycling goals. Lizard Head Cycling provides lightweight, carbon Scott rental bikes. We believe the most important factor in enjoying a tour is for each client to be physically comfortable on his/her bike. We ensure our clients have the appropriate size bike then we spend time adjusting your saddle height and position. The real test begins when the ride starts, and we plan on stopping and fiddling with micro fitting throughout the first day, and as needed through the rest of the trip. Everyday, we have at least one guide riding with the group and van support. We provide an aid station every 15 to 25 miles and regular opportunities for clients to ride in the van for any portion of the tour. The tour is about your own personal challenges and goals, and we are there to support you.